You have probably heard of a fabric jelly roll. 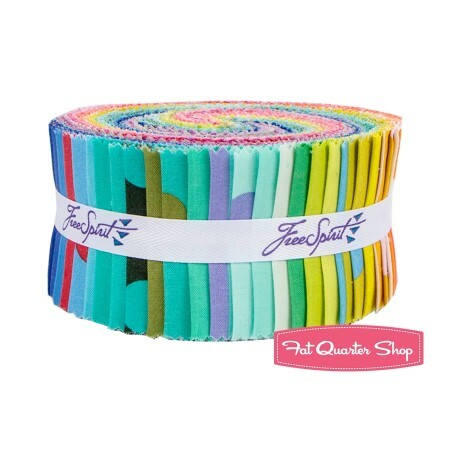 It’s a bundle of fabric made of 2 1/2″ wide strips by about 42″ long. Here’s one sold by the Fat Quarter Shop. But have you ever heard of a jelly roll race? 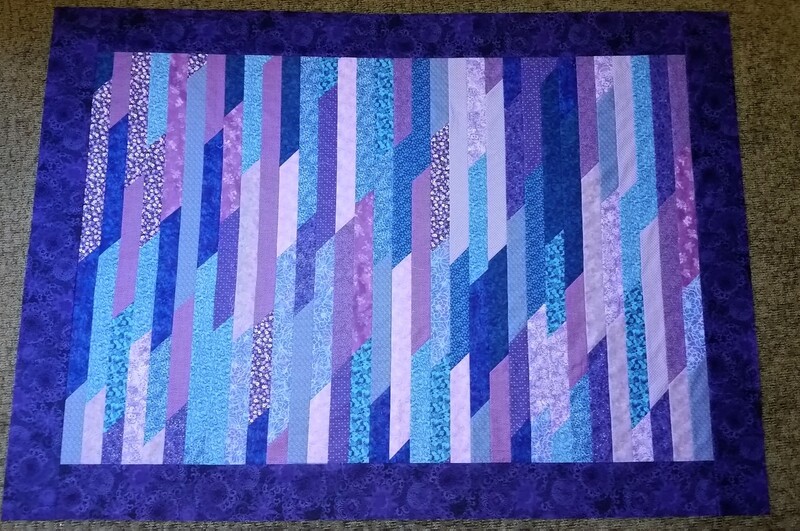 This is an event where quilters will see who can be the first to finish sewing together an entire jelly roll to create one quilt top. Visit this link to see an example. 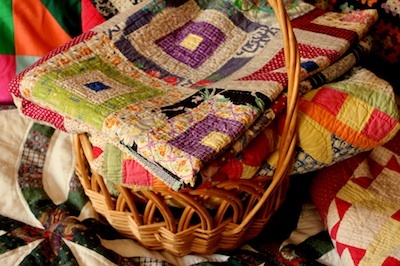 What if you want to make this quilt, but don’t own a jelly roll and don’t want to drive to the fabric store? 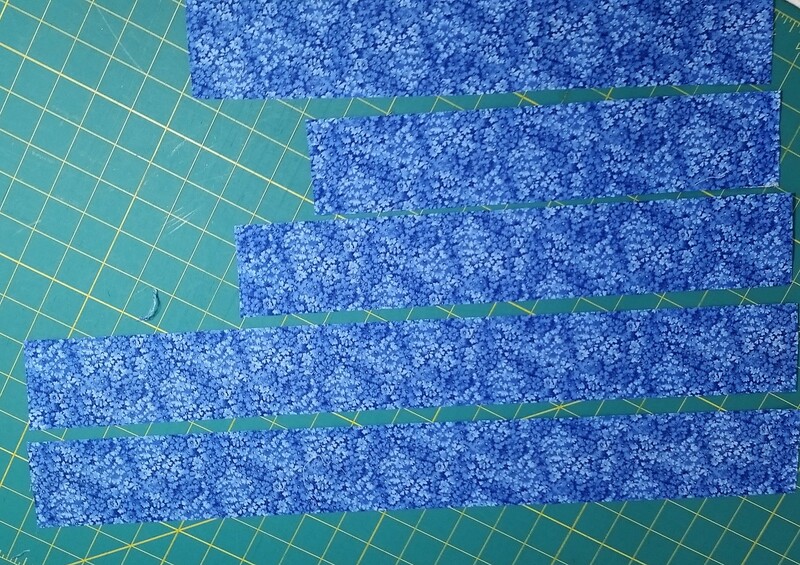 What if you own lots of fabric, but none of it is cut into 2 1/2″ strips? 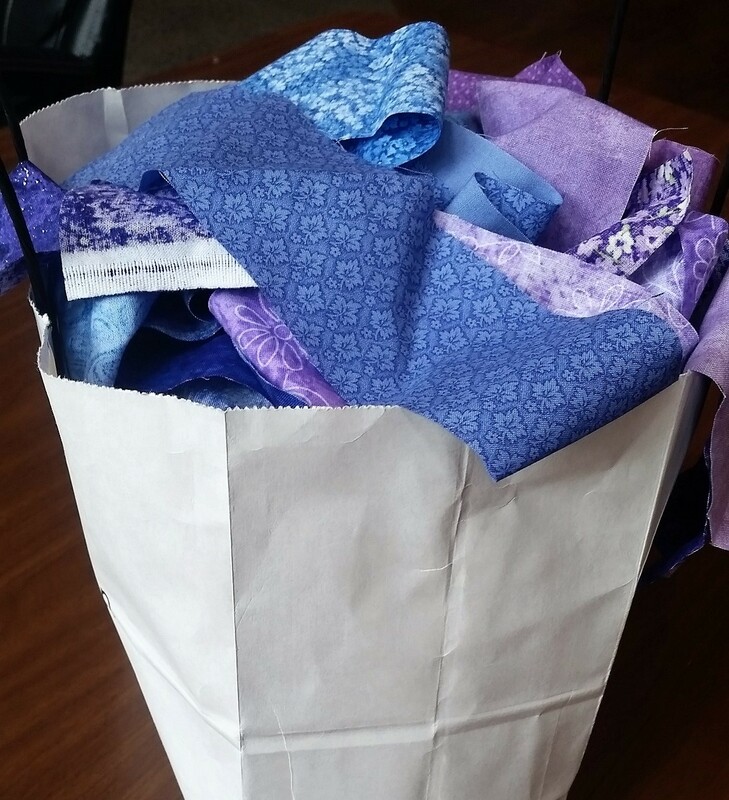 What if your significant other would really like to see you use up some of your fabric before you buy any more, even though jelly rolls are small and don’t really cost a lot? Wonder no longer! You have come to the right blog! 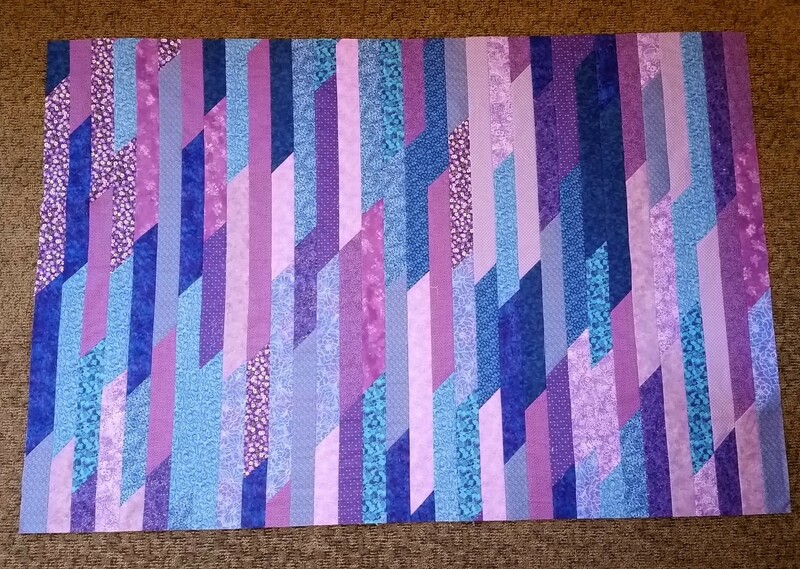 This is how you make a jelly roll race quilt without owning a jelly roll or actually competing against anyone. I put all the strips in the middle of the table and mixed them around. Then I put them in a sack which I set by my sewing machine. 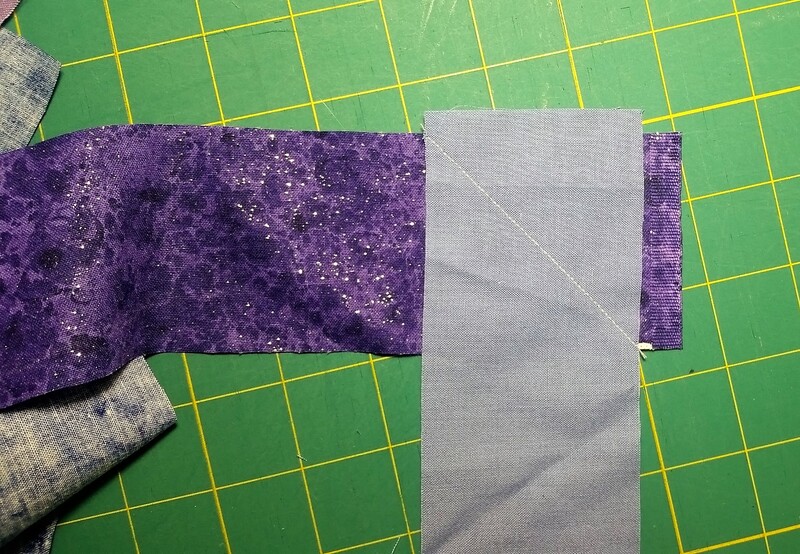 After I joined the first two strips, I added a third strip to the second, a fourth to the third, etc., mitering each join, until I had sewn together all the strips into one, long strip, about 1680” long. Then I folded that very long strip in half, put right sides together, and sewed a ¼” seam down the long edge. 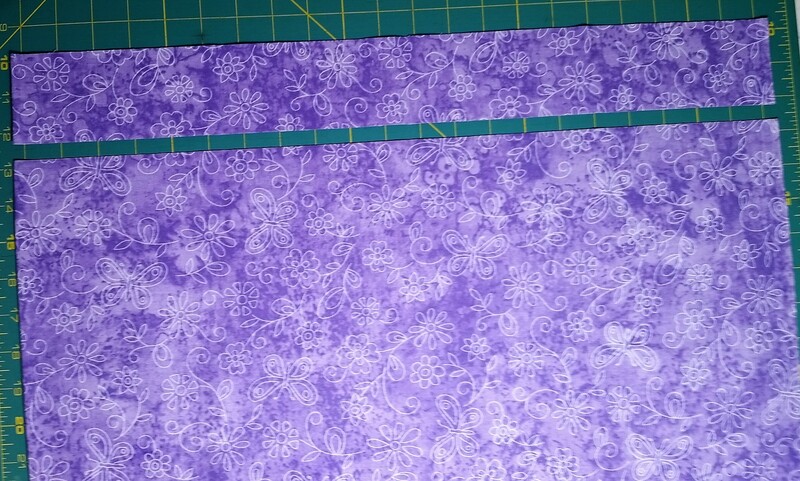 I now had two strips sewn together into a strip set about 840” long. 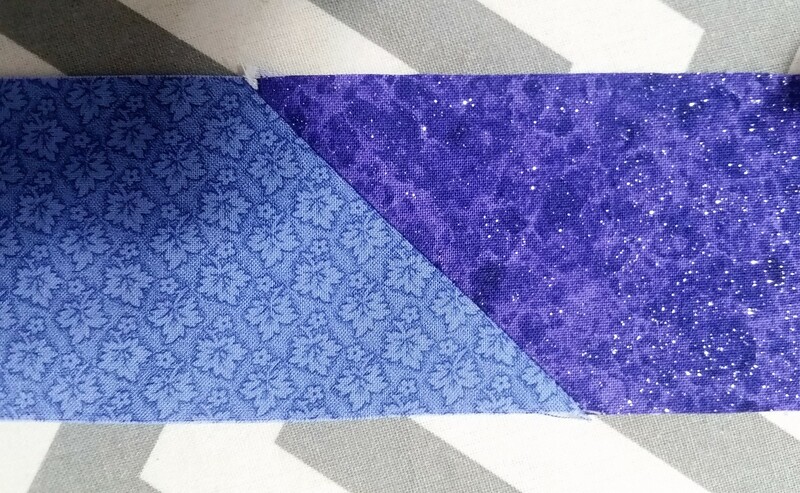 I folded this strip set in half, sewed another ¼” seam down the long edge, and I had four strips sewn into one long strip set about 420” long. 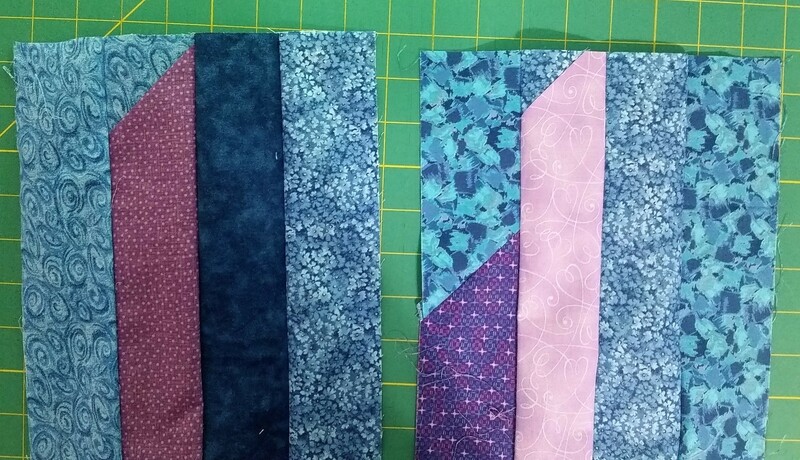 The photo below shows both ends of the four-strip set before I put right sides together and sew them together down the long side. I continued this process until I had created a rectangle, which I trimmed to a size that I liked. It would have been very easy to quilt this pattern with a walking foot: straight lines in the ditch (in the seams between the fabric strips), straight lines in the middle of each strip, or straight lines about every three inches running perpendicular to the strips. 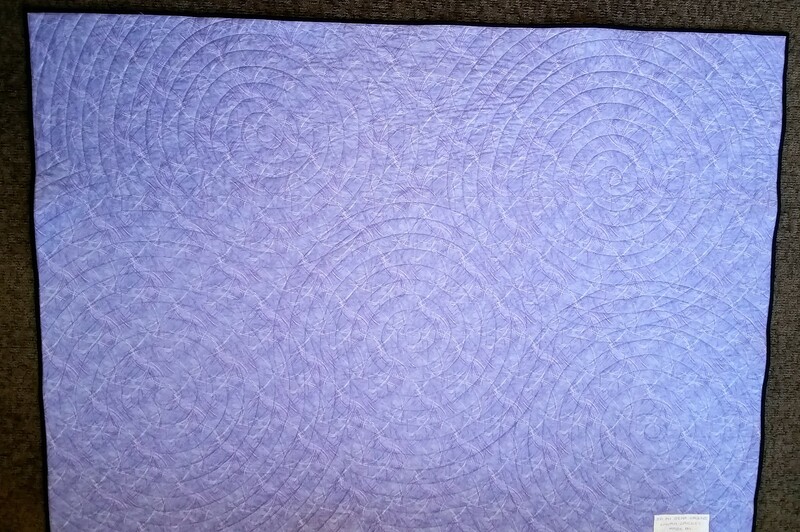 But this quilt is already full of straight lines, so I decided to quilt five, large spirals. 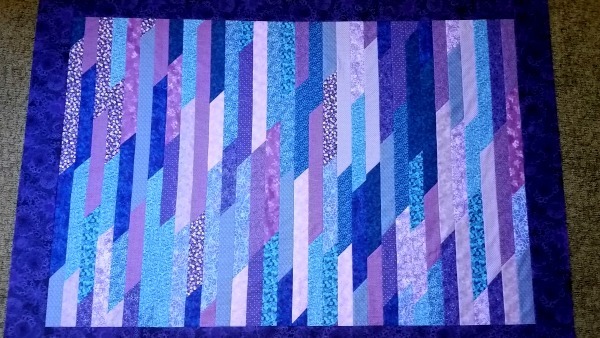 I love the look of spirals, though they are trickier to quilt than straight lines. (It’s very easy to quilt pleats into the back of the quilt where the spirals start to cross each other.) It’s easier to see the spirals on the back of the quilt. Here’s a closer view of some of the spirals from the front. For more ideas on jelly roll race quilts, do an image search in Google or go to this page at Quilting Tutorials. Be sure to join me next month! 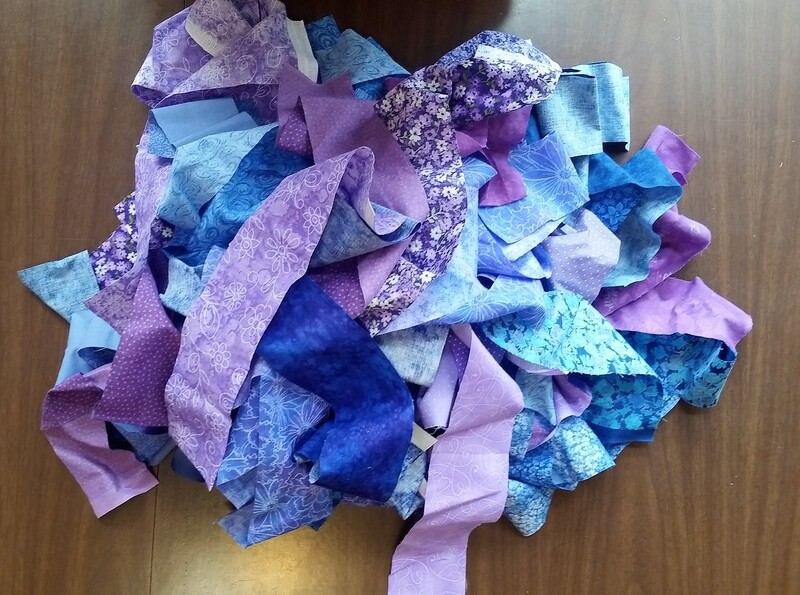 I have a trillion more quilts to show you–well, maybe only ten. Beautiful quilt. 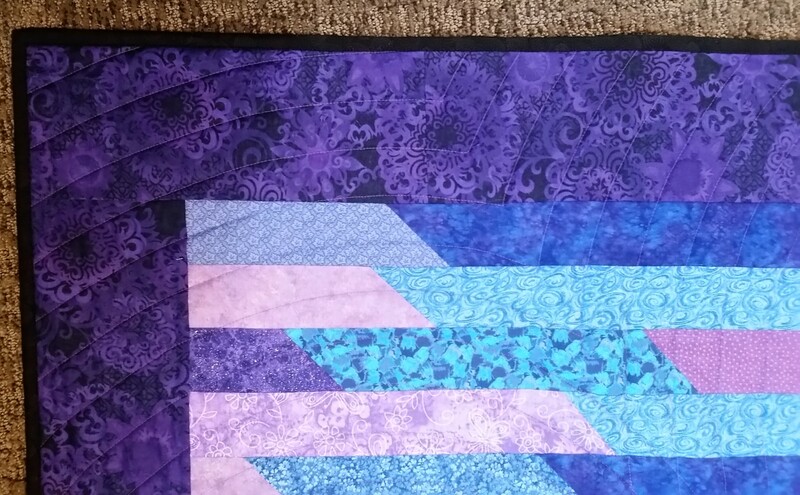 That wide indigo border is fabulous. It really pulled it all together into a masterpiece (is that an unintentional pun?) Great work. Kathleen, my sister really has a way with colors and patterns. I see fabric before she puts it together, and I think, “How is she going to make that look good?” And she always does.